Is your bedroom feeling a bit too basic? Believe it or not, you won’t need to commit to a major overhaul to transform your bedroom into a luxurious sanctuary. With a few additions and edits, your bedroom can look and feel luxurious. Here’s what to do. 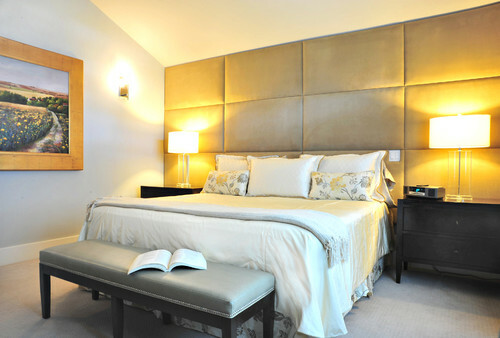 If you love how a hotel room exudes luxury and you want your bedroom to feel similar, you can do it by layering. Try adding a down topper to your mattress, then a down comforter inside a duvet cover. If you’re allergic to down, opt for a coverlet over a soft blanket. Several bed pillows, overstuffed decorative pillows, and a throw at the foot of the bed will complete the look. You’ll be anxious to crawl into your comfy cocoon every night. Nightstands without drawers don’t work for a lot of people. The truth is – even one drawer can help keep clutter at bay. An uncluttered bedroom is more likely to feel luxurious that one with tchotchkes strewn about. If you have a bedside table, considering switching it out for a nightstand with drawers and keep your belongings inside. Use warm white light bulbs. It’s no surprise that lighting creates ambiance, and in a bedroom, we need more mood than we do in other rooms. 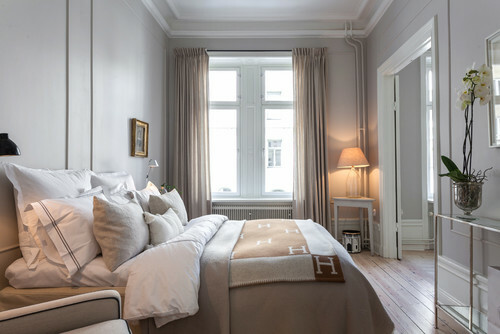 Switching bulbs to warm white can make all the difference in the overall feel of your bedroom, and even make you and your mate or guests look more attractive. Less furniture doesn’t need to make a room look sparse or empty. Place a few quality, key pieces –– a bed, dresser, nightstands, and perhaps a chair or chaise lounge, and let each item shine.